One of the most extraordinary facts about Mega Man 2 is that it almost didn’t happen. 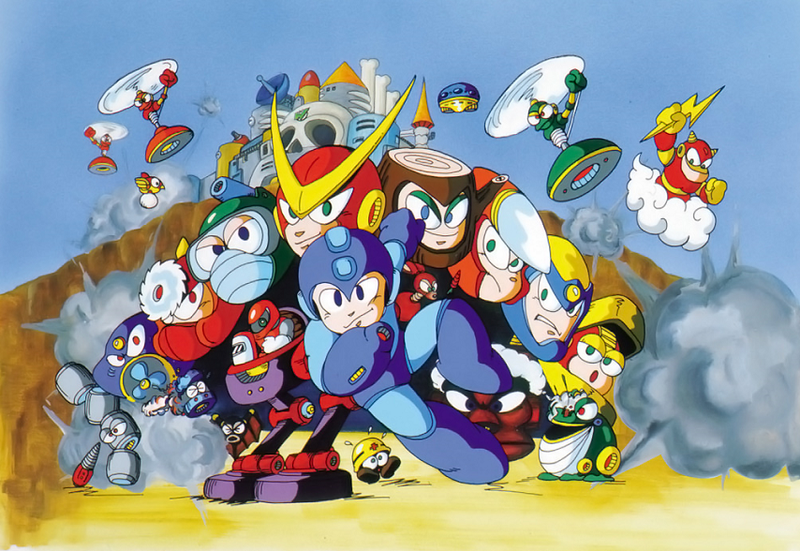 Sales of the first Mega Man were low, and it was only with the special permission of Capcom’s vice president that development was allowed to proceed. But there was a catch. The staff had to work on it concurrently with other projects on their own time. It was a labor of love and every aspect, from the anime influenced graphics to the incredibly catchy music, elevated it from a solid action platformer that incorporated the concepts of rock-scissors-paper into a classic. On top of that, Mega Man 2 also ended up being one of the best-selling title in the series. This was in large part because Capcom mixed up the formula and designed stages that were creatively imbued with themes from their respective bosses. Quick Man’s level is one of the best, not just because it was so different from all the Mega Man stages until then, but also because it has some of the most interesting uses of speed. I almost always tackled Quick Man last as it’s one of the hardest in the game. Immediately off the bat, what makes the stage so unique is its vertical structure. While it’s true that many games have levels where you climb upwards, Quick Man had you racing down. Even among Mega Man games to that point, the vertical stages were always in ascent like with Elec Man from Mega Man 1 and Crash Man from 2. But the concept of speed isn’t imposed on you by a timer or a race against an opponent. Instead, there are thick laser beams that will obliterate Mega Man if he isn’t quick enough on his toes. Even the graphic art for the walls gives subconscious visual cues to the layout of the stage with wires crisscrossing all over the place. In the opening of the stage, the first thing you’ll notice is the extra life in the upper left corner of the screen. The best piece of equipment to reach it is item-3, which is the crawling platform Mega Man acquires in the Flash Man stage. This is an indirect hint that Flash Man’s weapon, the Time Stopper which freezes time, will be crucial to passing the stage. But the opening 1-up also serves as a subtle warning that you’ll be dying a lot if you’re not careful. The first time you come across the lasers, the initial drop will actually take Mega Man underneath their reach, so the player is taught about their existence with very little risk of dying. The sound effect for the beam is a further hint about its motion, with walls impeding their path. There is an annoyingly placed Springer, which is impervious to Mega Man’s regular blaster. Their main purpose throughout the stage is to slow Mega Man down. The second room Mega Man drops into is also very straightforward, though there are two paths down this time. You can choose to move Mega Man either left or right. Again, the lasers are easily avoidable. The gap in the right is much wider than the left, so most players will most likely drop that way. The third room is the first time players have a real chance at getting killed. That’s because the drop to the right leads to a 1-up, energy tank, and weapon power refuel, but has a tightly placed laser beam. If Mega Man drops left instead, they’ll miss all the extra items, subconsciously showing the players that different routes lead to different results (the riskier path leads to more rewards). This whole first segment is a warm up for a more intense drop later in the stage. But in case players weren’t able to get through the initial descent, the developers were kind enough to throw in that 1-up at the beginning so you can start back where you were. The accelerated pace suddenly comes to a halting crawl and Mega Man finds himself in a long hallway. The motif of speed is reversed a the entire room goes dark and the whole layout isn’t visible. Instead of rushing through, I slowed Mega Man down. A Changkey Maker lights up the room and the wall sprites have changed color, lit up by the fiery source from the anthropomorphic torch. Destroying it turns the room dark again. I was running and jumping blind, trying to hurry to reach the Changkey while warily progressing in the black spaces. Once you reach the end, it’s time for a relentless wave of laser beams. This is not just the most difficult part of the stage, but also one of the hardest sequences in Mega Man 2. The beams will fire from both sides of the screen and one misstep leads to immediate destruction. Whereas before, there were walls impeding the lasers, now they fire all the way across. Death will be certain the first few times through. Fortunately, this is also the best place to use the Time Stopper. Unlike the other items Mega Man acquires, once you initiate the temporal freeze, it’ll run until the gauge goes dry, meaning you can’t simply pause and unpause it at will. So players are provided with a dilemma. The boss, Quick Man, is weak to the Time Stopper. Use it here, or save it for the boss? The little twinkles indicate the Time Stopper is in use. I always used it here, though the stopper won’t last the whole way down. The developers were kind enough to provide a weapon power refill halfway through the sequence for the Time Stopper so that only a small segment requires real time navigation. However you do it, this was one of the most effective displays of how the mechanics from two very different bosses overlapped, affecting the gameplay to turn Quick Man’s extremely difficult level into a feasible one. Speed was important, but speed could be beaten using this new tool. Players were in a sense “outsmarting” the game design with an alternative method. Rock triumphed over scissors until an even stronger scissor temporarily reversed the rules. The last trek in the stage has Mega Man fight against Sniper Joes, mecha units that are very difficult, again forcing Mega Man to decelerate. The pacing throughout is deliberate, going fast->slow->fast->slow before a speedy battle against the boss, Quick Man. The Sniper Joes are weak to the Air Shooter, giving a hint about another of Quick Man’s weaknesses (I prefer using the Air Shooter over yet another weakness of his, the Crash Bomber, just because it’s easier to hit him using the former). Quick Man is one of the more aggressive bosses, launching himself at Mega Man from the beginning. If you’ve already used your Time Stopper, a few well-placed air tornadoes will dispatch him so that Mega Man gains the Quick Boomerang. Appropriately, it’s one of the fastest weapons in the game. Quick Man’s stage remains one of the most memorable, not just for its distinctive level design, but it’s incredible level music. In a series where almost every track is a retro classic, Quick Man’s still stands out as one of the best with its catchy beats and rhythms. Mega Man 2 is still my favorite game in the series and levels like Quick Man cement its status in the pantheon of 2D platforming greatness. My only wish is that Mega Man could have acquired those huge laser beams as his new boss weapon.